Model WH5500 includes the Westinghouse, 357 cc, OHV engine that has been designed for power, durability and quiet operation; it comes with an oversized muffler and catalyst. All Westinghouse generators come with EZ start, color-coded starting controls and access to a friendly and knowledgeable customer service group that can be reached at 1-855-WH-HELP-1 (944-3571). This model can be assembled very quickly and is easy to operate with a simplified power control center and is backed by an industry leading 3-year limited warranty. Other items included are never-flat tires, high-leverage handles, tool kit, one liter bottle of oil and a funnel to get you started right out of the box. 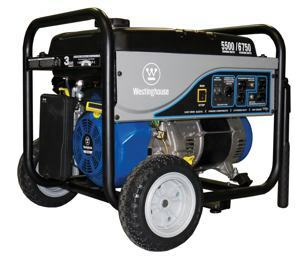 Safeguard your family as well as provide portable power for work and play with the Westinghouse WH5500 gas-powered generator, which delivers 5,500 running watts of power and a maximum starting output of 6,750 watts while providing the owner with many features and benefits usually found on more expensive models. The WH5500 gas-powered generator with 5,500 running watts and 6,750 starting watts (view larger). The WH5500 provides quiet operation via Westinghouse’s Pulse-Flo muffler, includes four standard household outlets ready to conveniently power your devices, and is easy to operate thanks to the simplified control center. It also includes everything to get started right out of the box, including a wheel kit and handle kit, oil, funnel, and tool kit. This generator is backed by a three-year limited warranty, and it’s EPA-approved. Powered by a high output, durable 357cc Westinghouse XP Series engine, the WH5500 features an overhead valve design for excellent performance, cast iron cylinder sleeves for low oil consumption, and forged pistons and connecting rods for proven strength. Starting is easy thanks to the Comfort Grip manual recoil handle and compression release, plus the transistorized ignition provides lifetime ignition source. The efficient engine gives you up to 14 hours of run time at 50 percent load with its 6.6-gallon tank. The low loss, high efficiency alternator laminations increase electrical output and decrease fuel consumption. Automatic voltage regulation provides reliable and precise voltage control for demanding applications. Its cast iron fan guard ensures safe operation, while the Maintenance free brush excitation ensures zero down time operation. Easy-to-use control panel (view larger). Featuring an all-steel construction and fully enclosed electrical connections, the WH5500 can withstand the harshest environments and weather. 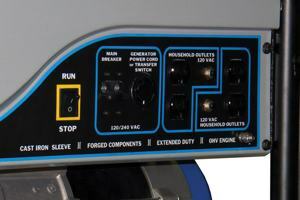 It features two 120 volt pushbutton circuit breakers for over current protection, a toggled mainline 240 volt circuit breaker for safe operation, and a quarter-turn Nema twist lock connector that provides a secure connection for available power cord and other devices. Color coded touch points make the interface easy and intuitive. The combination of ergonomically designed dual folding handles and robust never-flat tires provide easy transportation to and from job sites. Westinghouse generators are perfect for protecting you and your family for those unexpected power outages, but are also useful for powering many home appliances such as electric ranges, security systems, home power tools, lights, radios, electronics, and more.